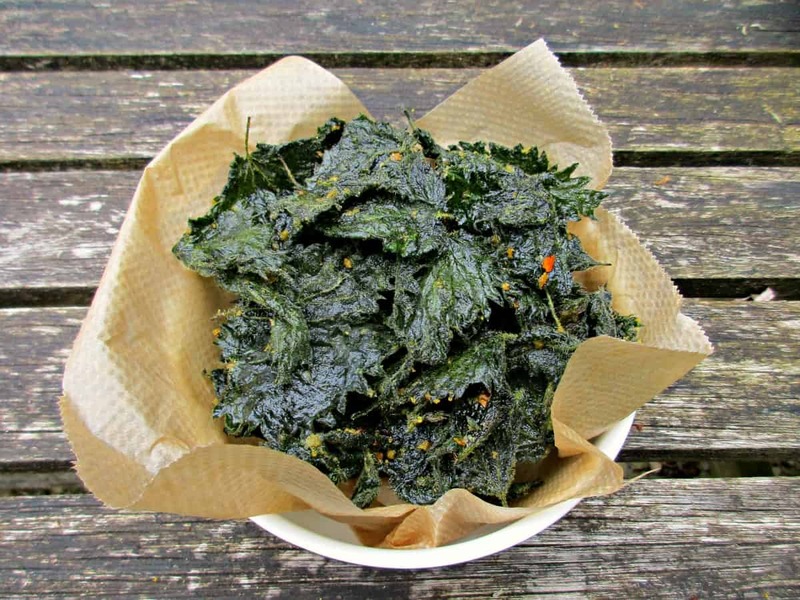 Today I am sharing my favourite stinging nettle recipe – Nettle Crisps. They are cheap and simple to make, delicious and incredibly healthy! 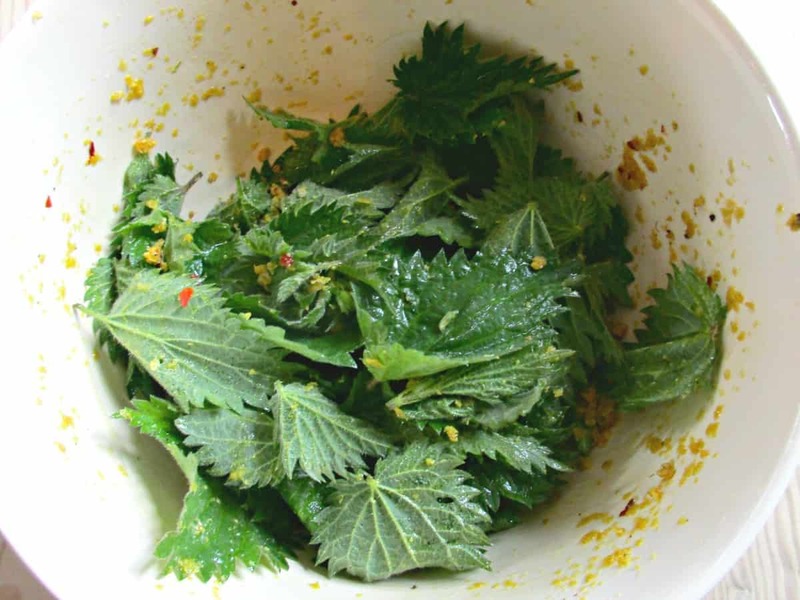 I have talked before about the substantial nutritional benefits of stinging nettles in some of our other nettle recipes. These include our Original Stinging Nettle, Apple and Pear Fruit Leather, Stinging Nettle Cordial and Stinging Nettle Liqueur. Nettles are one of the most abundant wild foods found here in the UK, as demonstrated perfectly by the photo below. Imagine being stuck in the middle of that! To avoid being stung, I do recommend you wear gloves when collecting stinging nettles, alternatively simply snip with a pair of scissors straight into your collection container, to avoid having to handle them at all. Homemade Vegetable chips are a brilliant alternative to shop bought snacks. They are cheap, easy to make, and super good for you. 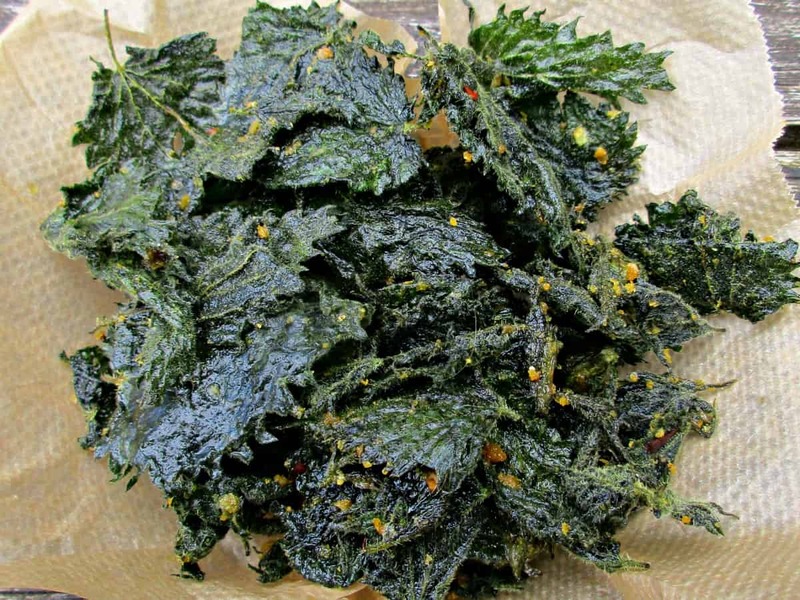 This nettle chip recipe can be easily adapted to use with other wild and homegrown greens. Wild garlic chips, in particular, make a tasty snack. Wash and dry the nettles, stripping the leaves from any stem. Combine all the seasoning ingredients in a large bowl, and toss in your leaves, so they get a good coating. Place the nettles on a baking sheet in a single layer. Note the leaves will still sting at this stage so take care and DON’T be tempted to try one yet! (Cooking the leaves will denature the sting). Bake in a low oven at around 130C until they crisp up. 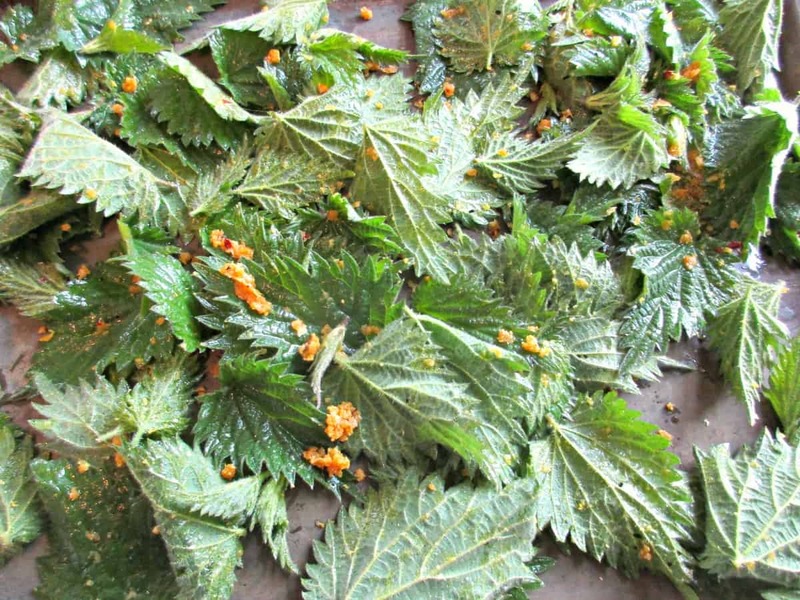 How long the nettle crisps take will depend on how much moisture is in the leaves. The nettle crisps shown below took about 25 minutes, and I turned them over once during that time. Pop the nettle chips in a bowl and tuck in. 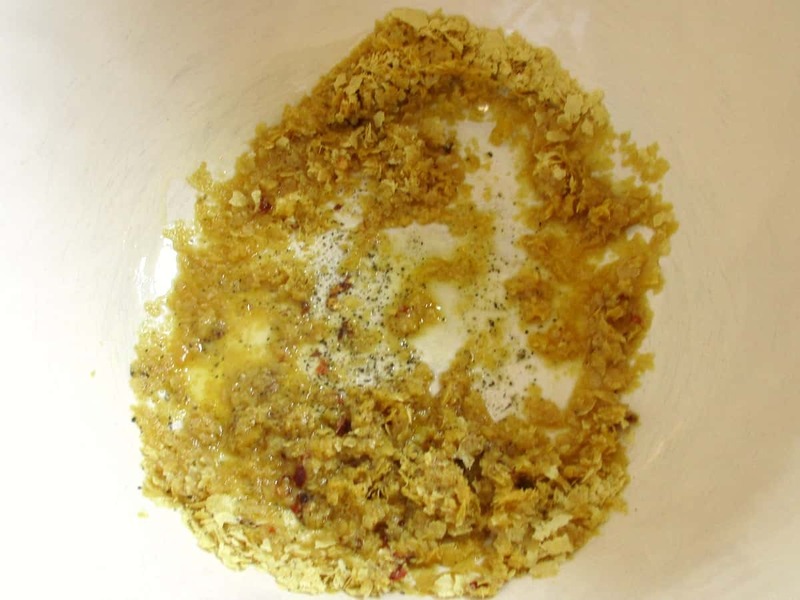 Nutritional yeast is a new ingredient for us but is widely available in health food stores. It has a nutty, almost cheesy flavour and is full of essential vitamins, so it is an excellent addition to your diet. These nettle crisps are truly moreish as well as being packed with nutrients, as proved by hubby who came home and demolished the entire bowl. Crisps made from wild greens are best eaten on the day they are made as they tend to lose their crunch over time. For more foraging inspiration, check out our other wild food recipes. Nettles are just poking through the ground here – looking forward to trying this! Thank you. from Maryland, USA … I’m wondering if a tad of vinegar in the mix would be awesome! This is such a great idea! And the recipe looks delicious. 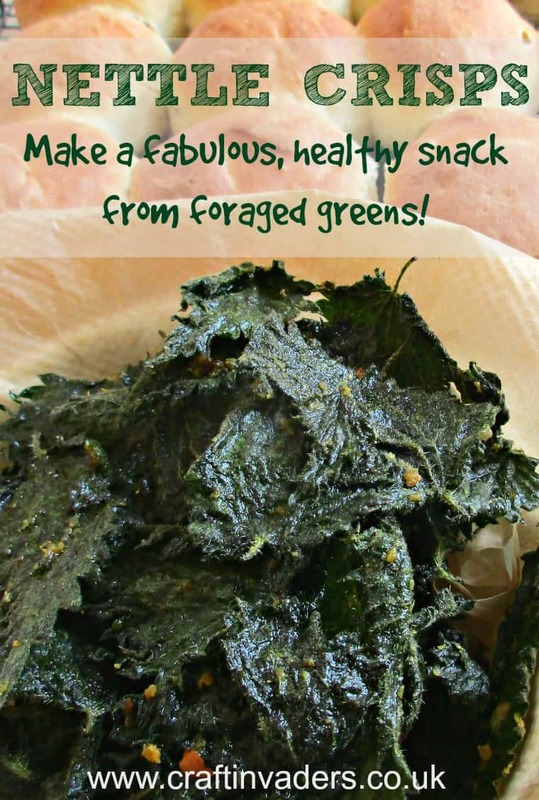 Wonderful recipe…we totally fell in love with this snack….got plenty of nettle around here….yay, like you say, free food! thank you! I am so impressed Sarah with all the recipes you come up with using wild food, and would love to try some of these. 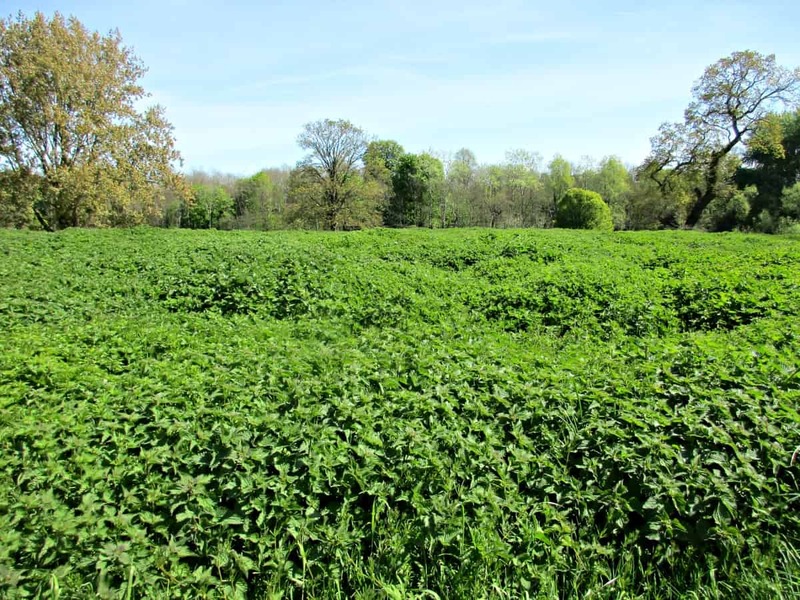 That sure is a big field of stinging nettle! I haven’t ever seen one that big, or thick. I have always tried to stay away from the stinging nettle after getting stung when I was young. If I happen upon any and I’m feeling brave I will have to give this recipe a try. I’m going to try these and bring them to the next farmers market! Was looking for just this sort of thing! Any idea about keeping long term? Wonder how the first brave person ever discovered that these were good to eat…LOL! I’ve been stung by a few before, so I steer clear, but this recipe looks GOOD! I might have to change my mind now!